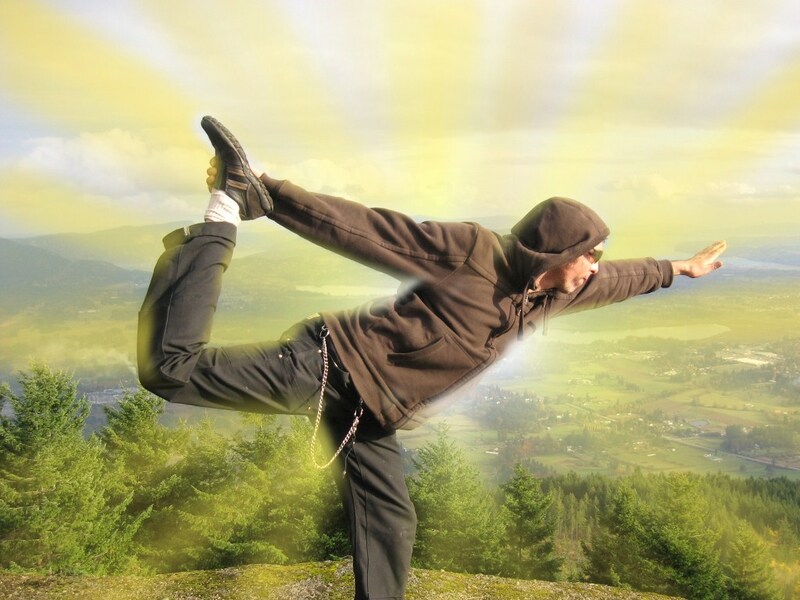 So I have this photo of paul doing a standing bow pose (not very well I must confess…) on the top of mount prevost taken over 2 years ago; and then about a year ago, maybe more…I stayed up late one night and played with it on photoshop…I decided to enhance it, with rays of “sunlight” emanating from him. I didn’t spend enough time to make it look pro…I just wanted to make it funky, put it on the desktop and use it to inspire him in his practice. This week the photo is up on the desktop as a symbol of accomplishment. Paul has just graduated from Ajna yoga 300hr teacher training. what a revolution!! Imagine, last fall i was setting up sun lotus as a yoga b&b, without an in-house teacher…sounds strange doesnt it…but i figured, we could just share our own journey and practice with others, and not neccessarily be credetialed. I figured that i know enough philosophy and theory to keep the knowlege flowing and i figured other teachers might just volunteer to stay and teach for us. but then, late last winter, we attended the victoria yoga conference–on a sunday (i havent had sundays off in the winter in several years–usually i am doing wedding viewings). At first it was just karla and i going, but then paul said he wanted to come too…Ok i said, i guess i will sign you up for the last yoga class of the conference–called recovery yoga. Karla and i attended kirtan and yoga dance. while paul was in class, karla and i perused the vendors and went for tea. When paul finished his class we said goodby to karla and jumped in the car. how was class i asked. its funny he said, i thought i wouldnt like it because it wasnt bikrams, i thought it might be too boring for me,..but i loved it, i really did, in fact i think i just love yoga all yogas!” that was cool. i asked then if he had the chance to fill in any ballots for the draws for half-price teacher training–we had recently been tossing the idea of him taking yoga teacher training–since he is the more physical of the two of us, and with his dyslexia, a hands on, practical kinesthetic class might be right up his alley & give us both something to offer our guests–he said everything was closed when he was done. oh well i said, i filled out a few…i guess if we win, that will be a sure sign we are on the right path. he agreed. The following monday when i woke up, i wondered to myself how long will it take for them to tell us we have won. needless to say, i was not the least bit surprised to open an email from ajna yoga to find out “one of us has won teacher training” it said one of us, because I had also put Pauls name on the ballot, to ensure that we would both qualify for the prize. This is not the first time what i have pictured has come true. 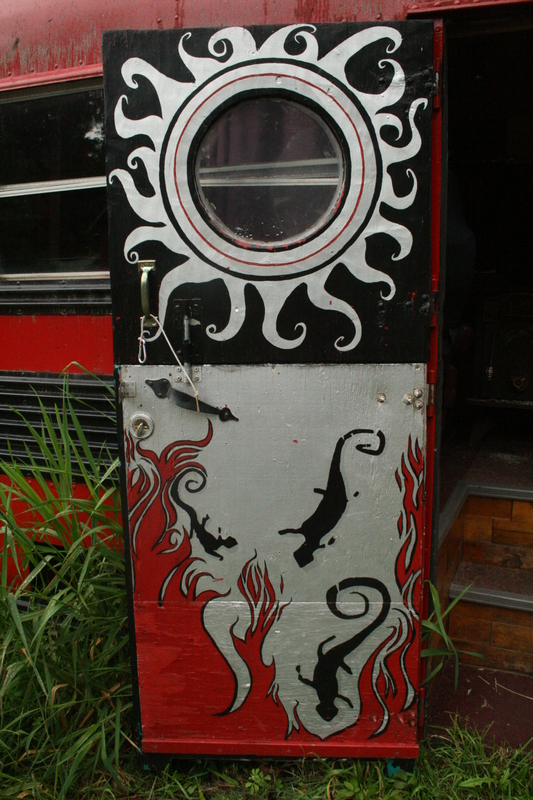 One of the most significant images i have created was a painting on the door of Pauls Iguana Bus. I had only known him for about 5 weeks, when he contracted me to redecorate his bus…on the door, i had this desire to leave some of the original paint show thru the new art & to attempt to break out of a habit of being so precise, so I attempted to paint an Iguana by painting the negative space around the iguana without a contour line to work from. This created a much more abstracted iguana than i would have normally drawn, the first one turned out ok-ish, but i thought i might do better a second time, then a third…I thought i would paint out the one’s i didnt like. when i stood back from the painting, i saw a very clear & startling vision of paul, myself and our child represented as these 3 iguanas heading into the fire (a life of risk & adventure) how true that has turned out!! integrity and the beauty we can achieve when we endeavor to show our true colors. In Hinduism the Peacock is associated with Lakshmi who is a deity representing benevolence, patience, kindness, compassion and good luck. Contemplation on the powers of the Peacock can supposedly bring you more vibrancy and vitality in your experience. 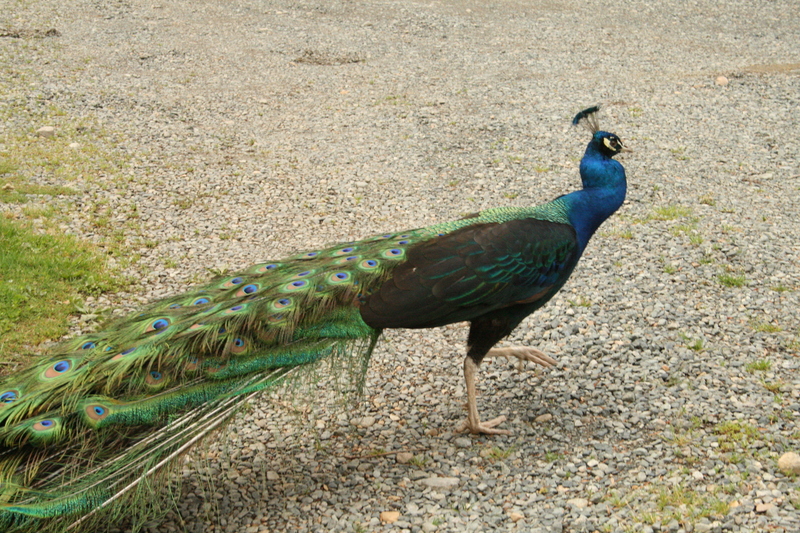 The Peacock can also help you on your spiritual Path, and breath new life into your walk of faith. 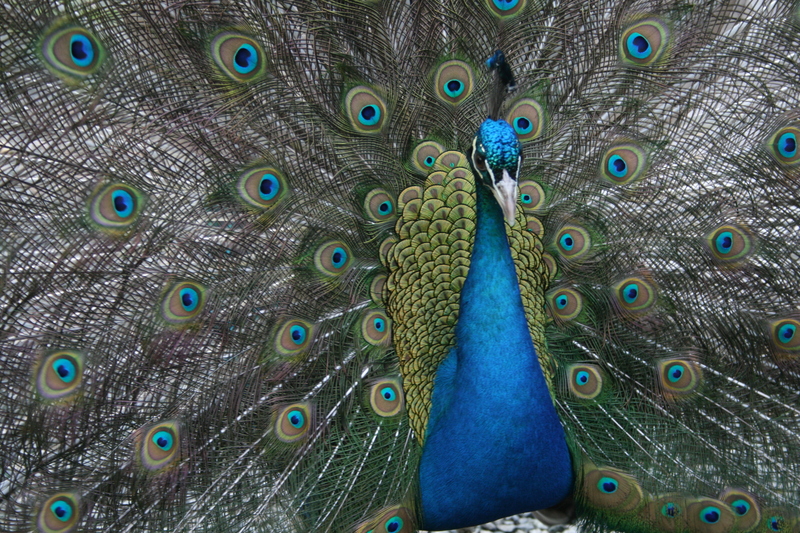 The Peacock can rejuvenate self-esteem levels too. 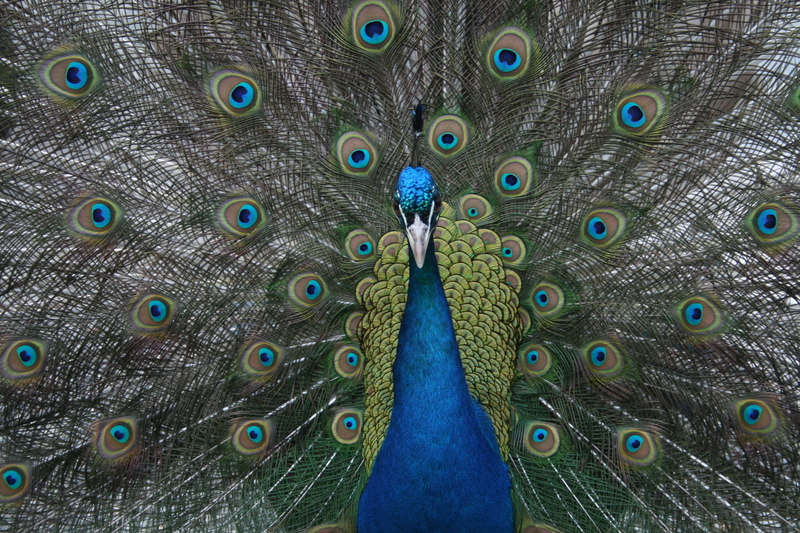 If you’re feeling “blah” and blue, imagining the glorious, techno-color display of the Peacock supposedly provides us a proper mood to embrace our own nobility. Peacock Feathers have been used for healing for tens of thousands of years in every culture throughout time. They are said to carry Spiritual Healing Energy that can be used to assist people seeking balance and harmony in their lives. With the proper guidelines of use, they allow the individual to connect with the Universal Healing Energy and use this energy to heal people of all of their complaints, imbalances and disease. Well, sadly on one of Paul’s very last yoga classes, we have had to move Mr Blue to a beautiful park by the ocean. Our neighbor just couldn’t bear the thought of the damage he might do while he occassional sat on his roof–and was completly acting mental over it, and since Mr Blue had lost his last girlfriend he was lonely and crying out alot. I miss him alot and still cry for missing him…the place isn’t the same without his stunning beauty and peaceful noble nature…he was too good to be true, we really really loved him, as did everyone else who visited here and got to know him on a personal level. I know he must be happy at the park, with all the beautiful gardens and tourists, it must remind him of home…and now at least he has lots of new friends.